Interested in couponing, but not sure how to get started? Here's everything you need to know to start saving 25-50 percent on your grocery bill. Newspapers. Smart Source and RetailMeNot publish the coupon inserts that come tucked in your Sunday paper. They include coupons for a variety of brands. Procter and Gamble publishes its own coupon insert at the start of each month. If this week's paper has a lot of good coupons, consider buying extra copies. Dollar Tree sells papers at a discount, so a lot of couponers buy their extra papers there. If clipping isn't your thing, you can print coupons or load them to your store loyalty card at the Smart Source, RetailMeNot Everyday, and P&G Everyday websites. Coupons.com. This website has hundreds of printable grocery coupons for all the major brands. They typically allow you to print two of each coupon, so be sure to max out your prints. Grocery and Drugstore Websites. Most store websites now offer coupons that you can download directly to your store card. This includes both manufacturer, as well as store-specific, coupons. Get in the habit of checking for new coupons before you head to the store. Sometimes there are even freebies. To redeem your coupons, just present your store card at checkout. Easy! Coupon Apps. Download free grocery apps, like iBotta and Checkout51. They make it easy to snag coupons and cash back deals for things you'd buy anyway. To save even more, look for opportunities to pair an app deal with other coupons (i.e. store coupons and/or manufacturer coupons). You can often snag freebies and moneymakers this way. Magazines. Women's publications such as All You, Woman's Day, Red Book, Family Circle and Good Housekeeping frequently carry manufacturer coupons. All You even puts together an index of all the coupons that each issue includes. Take a peek at some of these magazines the next time you're waiting in line, and you may just decide that buying a subscription is more than worth the cost. In-Store. Look for coupons on store shelves, on products and on the back of your receipts. Also look for coupons to print at the register. If you see a "Try Me Free" sticker on any product, be sure to check the packaging for a rebate offer. Shampoo companies frequently run these types of promotions. Junk Mail. High-value manufacturer coupons have started to appear in junk mailers, so be sure to look before you toss them. Direct From the Manufacturer. Check manufacturer websites for printable coupons, or contact companies (by mail, email, or phone) to request coupons for the products you use. Often just a quick note to let a company know that you love their products is all it takes to get a bunch of coupons. Store Mailings. Get a frequent shopper card for the grocery stores where you shop, and you may be rewarded with special coupon mailings that are customized to your purchase habits. It's a great way to get coupons for produce, meat and other items for which coupons are rarely available. On Products. Look in and on the packaging of the products that you buy for special loyalty coupons. For example, your favorite cereal may have a coupon on the packaging that you can use on your next purchase. Develop a filing system. Many couponers organize their coupons by grocery category—dairy, frozen foods, deli, etc.—but it's not the only way to go. If another system works better for you--by aisle, by expiration date, or something else—then put that plan into action. Find a container to hold your coupons. Use a shoebox, a storage container, a coupon binder, a coupon wallet or a recipe box. What you choose isn't as important as having a single landing spot for all of those coupons. File coupons the same day you get them. Okay, so you may not always have time to file your coupons right away, but try to file them as soon as you can. 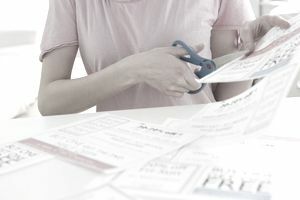 Staying on top of this task prevents the coupons from getting lost, and saves you the hassle of having to sort through a big mess of coupons all at once. Purge regularly. Expired coupons won't save you money, so don't let them hog space in your coupon file. Set a schedule for purging expired coupons, and stick to it. If you prefer to use digital coupons, check to see if your grocery store allows you to print a list of the coupons that you loaded to your store card. This feature is often available on grocery websites, and makes it easier to shop. Shop at stores that double coupons. Keep your coupons with you at all times. You never know when a deal might pop up. If you find a product on clearance, and you happen to have a coupon for that product with you, you'll get an even sweeter deal. Match coupons to sales. Use a site like couponmom.com or Hip2Save to help you. When you have coupons that exceed the value of the items you're buying, use them at Walmart. They'll allow you to apply your coupon overage to other items, or will even give it back to you in cash. Learn each store's coupon policy, so you know what you can and can't do. It should be available on their website. Consider printing a copy, so you can show it to the cashier, if you run into any trouble with a deal. Get creative. These clever couponing strategies will help you save even more.